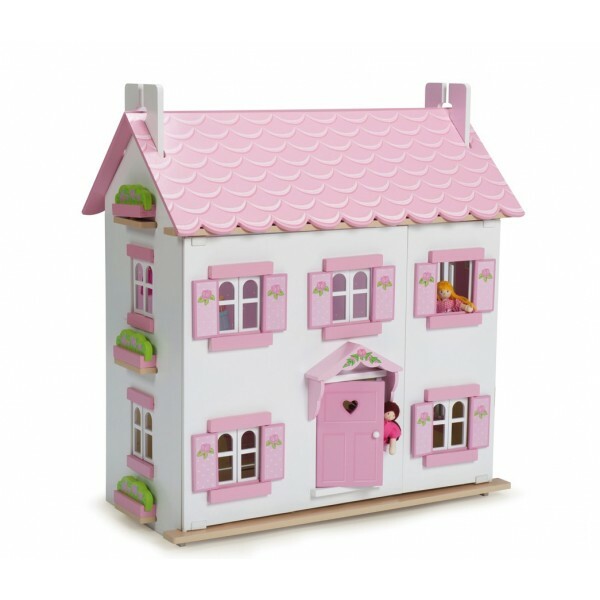 The beautiful Sophie's House from our friends at Le Toy Van is a wonderful first dolls house. Made to the highest standards of quality and safety, this classic dolls house is finished in clean white with pastel pink and glitter details. There's also a glittery scalloped roof, and a floral motif throughout. With three floors, an impressive central staircase, a removable roof, a loft ladder and fully opening shutters windows and front door, this is a strikingly beautiful dolls house, with loads of play value, that will grace any bedroom or playroom. This is a brilliant first dolls house, with lots of attention to detail and quirky touches, that will delight children now, and for generations to come. Sophie's House is fully painted and decorated inside and out. - by using a screen print finish Le Toy Van have been able to create a wipe clean exterior that's resistant to peeling. Le Toy Van's dolls houses are always so beautiful that they are almost like having a piece of art on show - they certainly make any bedroom look stunning. Dimensions: 35(D) x 61(W) x 67(H) cm. Sophie's House comes flat packed, with full assembly instructions.